Suggested Emphasis: Elderly people can serve the Lord. The Lord had promised Abraham, long ago, that He would make Abraham’s descendants into a great nation (Genesis 12:1-3). The promise had passed down through many generations. Now the people possessed all of the Promised Land. When the Lord told the Israelites to divide the land, Caleb had a special request of Joshua. Caleb was an old man, but he still remembered forty-five years before when he was one of the twelve spies who had spied out Canaan. Because Caleb had had faith that God would help Israel conquer the land (even though the enemy seemed liked giants), Moses had promised him land. Although he was old, Caleb still believed that the Lord could help him fight the enemy. The Lord told Joshua to give the land of Hebron to Caleb. Caleb did indeed overtake the enemy and occupy Hebron. Even though the Lord had given the new land to His people, they were still required to physically possess it. This meant that they had to conquer the nations that were living there. Israel gained control through two primary campaigns, the first one to the south and the second through the north. The southern campaign dragged on. In all, it took nearly seven years for the land to be subdued. After the land was under control, God instructed Joshua to divide the land among the nine full tribes and the half the tribe of Manasseh which had not yet received an inheritance. Prior to Israel’s entry into the land, the tribes of Reuben, Gad and half the tribe of Manasseh had received their land on the east side of the Jordan River (Numbers 32:28-33). The tribe of Levi received no land inheritance. Their inheritance was a share of the sacrifices (portions not consumed by fire in the actual sacrifice act—Joshua 13:14). They were to live in assigned cities within the lands of the other tribes (Numbers 35:1-8; Joshua 21). Chapter 13: A description of the whole land and specification of the land allocated to Reuben, Gad and Manasseh east of the Jordan. Chapter 14: Caleb’s individual portion (today’s lesson). Chapter 17: the half-tribe of Manasseh’s western portion. The “half-tribe” of Manasseh was so called simply because a portion of the people of Manasseh had already received and on the east side of the Jordan River (Numbers 32:33). Chapter 18: the Re-assembly of the nation at Shiloh. Benjamin’s portion. Chapter 19: portions allotted to Simeon, Zebulon, Issachar, Asher, Naphtali, and Dan. Caleb had been about forty when he first entered Canaan as a spy. Because of his good report, Caleb was promised the land of Hebron as his reward. Forty-five years had passed since the spies returned, and it was now time to divide up the land. Joshua and Caleb were the oldest Israelites. All Israelites who had been over the age of twenty when the people refused to enter the land died during the wilderness wanderings. Only Joshua and Caleb had been exempt from that punishment (Numbers 13-14). A leader as old and highly respected as Caleb could have left it to the younger men to conquer the country where the giants lived, but not Caleb. He knew that God could and would help him even though, by human standards, he was a very old man at eighty-five. Caleb must have remembered the Anakites from the days when he was a spy (See 12 Tribes and 12 Spies). The other spies reported on the strength of the Anakites and that the Israelites were like “grasshoppers” in comparison (Numbers 13:31-33). Whether they were physically big or “giants” through their power, Caleb is not afraid to go and take the land from them (Joshua 14:10-12). Joshua granted his request, and Caleb drove the giants out. Caleb wasn’t afraid of anything the Anakites could do, because he knew what God could do. He did not use his age as an excuse to stop working for God. He trusted in God, and God gave him victory. Caleb had trusted in God as a young man and he continued throughout his whole life. Children need to see examples of elderly people who still live a full life for the Lord. Long, long ago the Lord promised to give His people their own land. He made the promise to Abraham, Isaac, Jacob, Jacob’s 12 sons, Moses, and to Joshua. After all of those years, the Israelite people were in their own land. They fought many battles but the Lord helped them. Now it was time to divide the land so that all of the tribes of Israel would have a place to live. The Lord told Joshua to divide the land among the twelve tribes of Israel. Ten of the tribes were names after ten of Jacob’s sons. These tribes were Reuben, Simeon, Judah, Issachar, Zebulon, Gad, Asher, Dan, Naphtali, and Benjamin. Joshua gave each of these tribes their own land. The two tribes named after Joseph’s two sons were also given a share of the land. These were Ephraim and Manasseh. Now the land of Canaan was divided between all of the tribes of Israel so that everyone had a share. God did help Caleb send away those giants and take over the mountain. Then Caleb took all his family to live with him there for the rest of his life. He kept following God and doing what God said, and God was always with him. Joshua was happy that he had been able to lead the people of God into their own land. Now Israel possessed all of the land that the Lord had promised. He hoped that the people would always remember to follow God. If they followed the Lord then the Lord would always protect them and take care of them. Many of the children will have a map in the back of their bible showing the division of the land. Show them how to read their map. You could also bring a bible atlas and use that. Invite an elderly Christian to class today and let them share some of the things they do for God. They could share their favourite scriptures, tell about their conversion, talk about their prayer life, etc. Ask them to talk about what life was like when they were young. Visit an elderly member or even a nursing home. Invite older adults to class today and let them join in making crafts with the children. How about doing hand-prints together. Colour a map showing how the Promised Land was divided up for the spies. 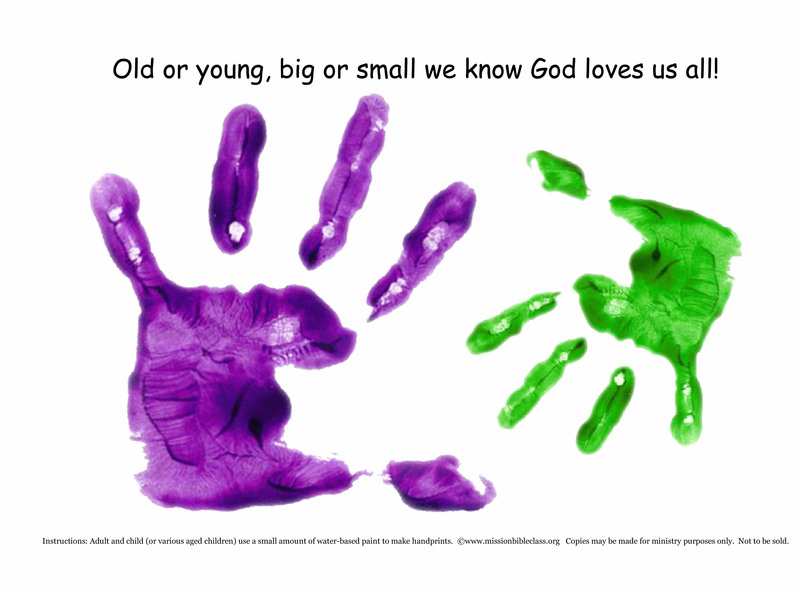 Use any blank paper or print this blank template: Multi-age handprints.